Youlan performed on Show 309, recorded in Vail, CO, on July 9, 2015, at age 15. She also appeared with the Clef Trio on Show 324, recorded in New York, NY, on May 24, 2016. 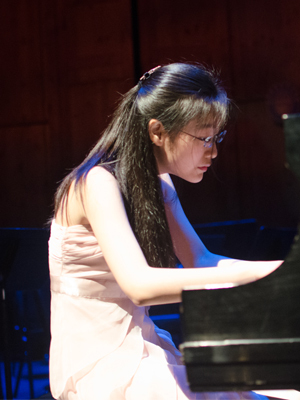 Youlan Ji (piano), 15, originally from Beijing, China, now resides in New York City, where she attends the Juilliard Pre-College Division under the direction of Yoheved Kaplinsky. She was admitted to the Juilliard Pre-College program at the age of 13. In 2011, at the age of 12, Youlan won first prize in her age group in the United States Open Music Competition, as well as first prize in the Third International Rosario Marciano Piano Competition in Vienna. Most recently, she won First Prize at the Beethoven Piano Concerto Competition hosted by the Juilliard Pre-College Division. Outside of music, Youlan is kept busy with schoolwork, and enjoys spending time with friends. Youlan is a Jack Kent Cooke Young Artist.